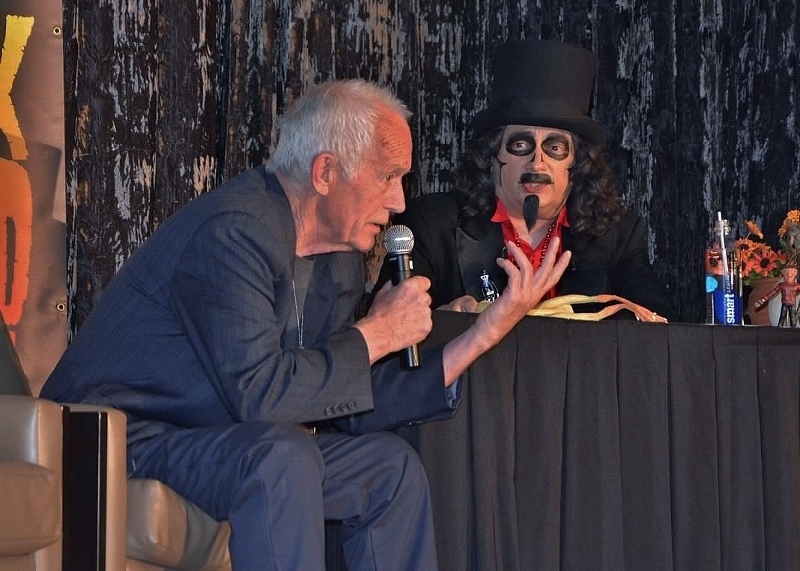 Svengoolie & Robert Englund: LIVE Talk Show at Flashback Weekend! 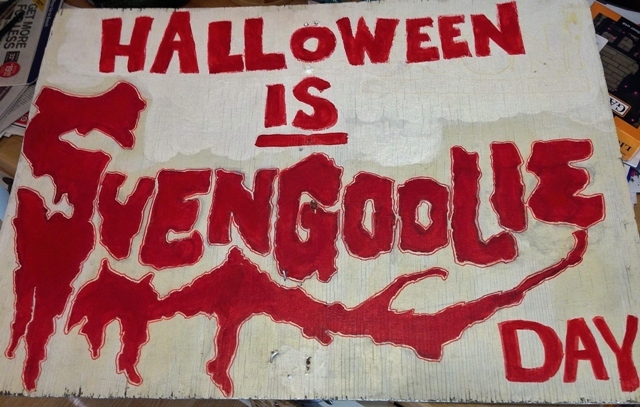 Happy Halloween and, if you live in the State of Illinois, Happy Svengoolie Day! Since hearing the news back in April that October 31, 2014 would not only mark my favorite holiday but also its merging with my favorite horror host, it seemed just too good to be true. Thanks to my formidable fellow fan, Brian Bernardoni, as well as Representative Kay Hatcher, the seemingly impossible has become reality and here we are. Sven will be busier than ever starting with an appearance on the You & Me This Morning Show on Chicago’s WCIU, various bumper spots throughout today’s MeTV programming, a radio appearance on Chicago’s WGN Radio, and stopping off at The United Center to help kick off The Chicago Bulls home opener. On behalf of The Terror Daves, we would like to congratulate our friend, Rich Koz, on this momentous occasion! We’d also like to toast Brian Bernardoni who, after several years of putting together an amazing Svengoolie-inspired yard haunt, has finally won first place in his town’s competitive Halloween Decorating Contest. Congratulations Brian on this well-deserved achievement as well as your pivotal role in today’s Svengoolie milestone! 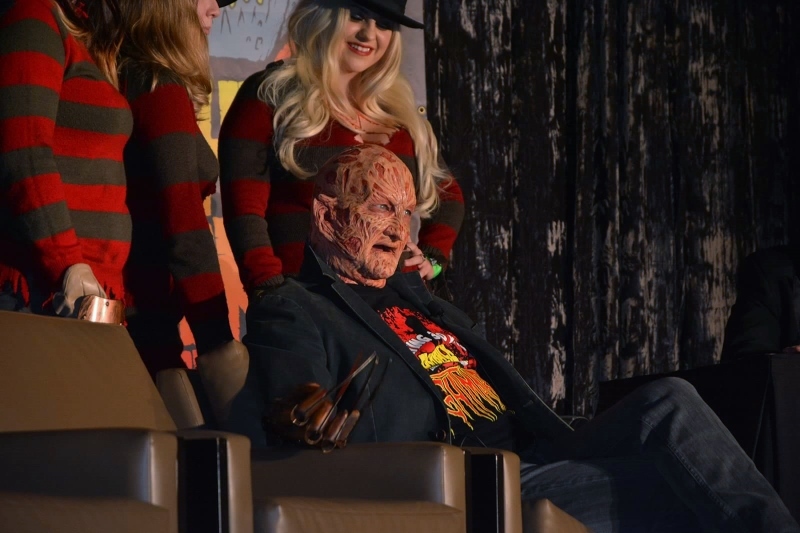 In celebration of this special day, I’m going to go back a couple of months and continue with the story of Sengoolie’s incredible evening at Flashback Weekend with Robert Englund (in full “Freddy” make-up) along with cast members from the A Nightmare on Elm Street films. In lieu of this one-of-a-kind situation, I decided to withhold that portion for Halloween/Svengoolie Day but, if the jumbled timeline confuses you, please feel free to “flashback” yourself to the first part HERE before moving forward. I should also mention that my coverage of his 35th Anniversary will commence next week and, hopefully, things will start flowing in natural order from then on. I’d also like to give special thanks to Jim Roche for allowing us to use his awesome photographs for this post. Not long after I took my seat the show began. Svengoolie took the stage and introduced his first guest, Robert Englund. 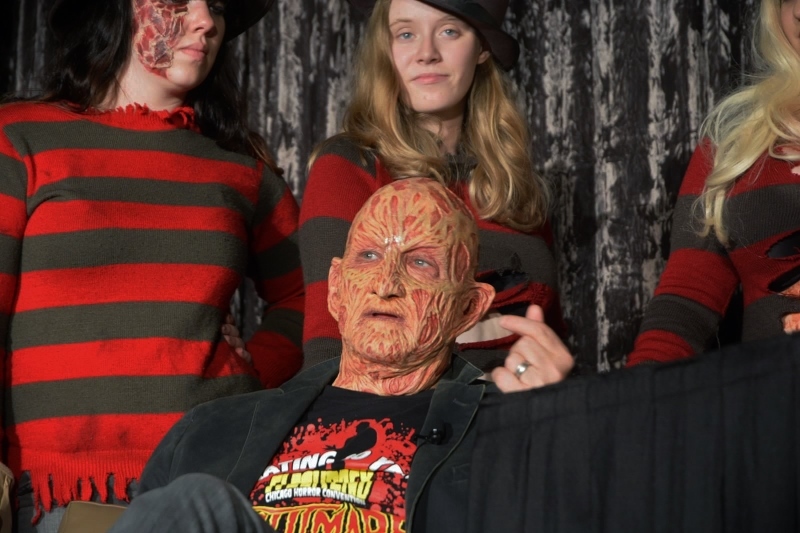 Though customary to save your best guest for last, Englund had already been wearing his Freddy make-up for several hours while greeting fans. As he’d explain later, he was “starting to itch,” so out of courtesy he’d be first on stage. Englund is tailor made for interviews and never runs out of anything interesting to say. I’ve heard him talk before at a cast reunion up in New England a few years back and can honestly say that man is a wealth of information and rarely repeats himself. He even manages to share more anecdotes than what’s included in his awesome autobiography, “Hollywood Monster” which I personally think warrants a sequel. Englund reiterated the importance of drive-in theaters and how it was tantamount in his agreeing to don the Freddy make-up for this event; the first (and possibly last) time since Freddy vs Jason. Proceeds were to benefit The Midway Drive-in in Sterling, Illinois as it undergoes the expensive (but necessary) conversion to digital projection. Here’s Svengoolie’s footage of Englund’s portion of the show which aired on MeTV September 27th, 2014. One thing I was surprised to hear was how he had an indirect role in the casting of Mark Hamill as Luke Skywalker in STAR WARS. Apparently Englund had tried out for the part himself before returning to his bungalow and seeing his pal Mark lying on his couch and watching the Mary Tyler Moore show. Englund suggested that the part would be perfect for him and encouraged him to audition…the rest being motion picture history. Next up were several cast members from the Freddy franchise such as Amanda Wyss & Ronee Blakely from the first A Nightmare on Elm Street, Robert Rusler from A Nightmare on Elm Street 2: Freddy’s Revenge, Jennifer Rubin from A Nightmare on Elm Street 3: Dream Warriors, and Monica Keena from Freddy vs Jason. This ended up being a lot of fun with Robert Russler stealing the show. Rusler’s father had been a studio security guard and he practically grew up on the movie lot. He told a great story about the day he began work on A Nightmare on Elm Street 2 with his father and co-workers beaming with pride and all showing up to give their well wishes. The show ended on a high note with the audience more than satisfied and Amanda Wyss intent on getting a “selfie” with the host. It was a fantastic experience and I can’t thank Svengoolie & Jim Roche enough for letting me be a part of it! Best Halloween wishes and Happy Svengoolie Day! This entry was posted in Convention & Expos, Horror Hosts, Slasher Movies, Stalking Svengoolie! 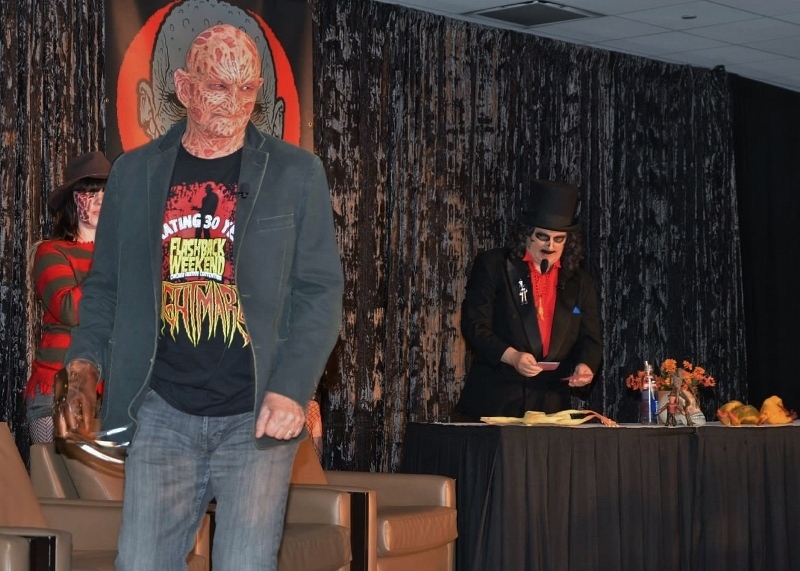 and tagged Flashback Weekend, ROBERT ENGLUND, Svengoolie, Svengoolie Day. Bookmark the permalink. Edward – I really appreciate you taking the time to write this. For one thing, it is always great to hear from fans from other states and I sure hope you can make it for a future appearance. Also, you are quite right about Rich Koz being deserving of his recent honors. He’s not only a legend in broadcasting but one of the nicest guys you could ever meet. Should you ever make the trip from South Carolina, you won’t be disappointed. I look forward to making the trek one day! Its on my must do list!